We often think of the big, flashy animals like the mountain lions and the coyotes when we think of the desert. All the living things in the desert matter though, even the tiny ones. The bigger animals depend on many plants and smaller animals to provide them with food. Decomposers like ants, fungi and bacteria are also important because they help recycle nutrients. This section describes the various desert creatures and how their lives are interrelated via food chains and food webs. Not shown in the illustration are scavengers and decomposers. Scavengers feed on dead animals. They are part of nature’s clean up crew. Decomposers break down both animal and plant materials so that plants can use the nutrients again. Food webs aren’t always neat and tidy. For example, javelinas are mostly thought of as primary consumers because they eat plant materials like prickly pear fruit and mesquite beans. They are also known to eat lizards, mice and dead birds, which would make them scavengers and secondary consumers, too. 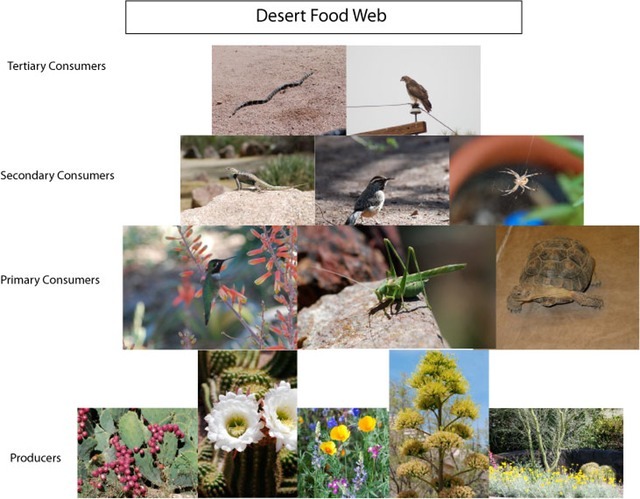 Activity: Create your own model or poster of a desert food chain or web.